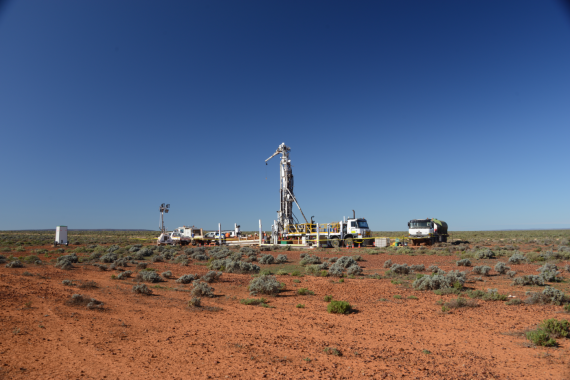 The resurgence of successful, greenfields mineral exploration in Australia is a step closer thanks to the trialling, in the South Australian outback, of new technologies that will lead to cheaper, faster and more successful mineral exploration. Over nine months, 14 holes and almost 8 km of drilling, the MSDP both tested DET CRC’s revolutionary new technologies and uncovered valuable geological information on the eastern Gawler Craton Olympic Copper-Gold Province, a district widely regarded as one of South Australia’s key emerging mineral provinces. Chief Executive Officer of DET CRC, Professor Richard Hillis, said “DET CRC’s focus was to trial its new technologies in a real-world drilling program in order to speed their transition from the lab to commercial products. “Australia’s share of mineral exploration expenditure has halved from approximately one quarter to one eighth of the world’s total in the last 25 years. The decline in exploration expenditure has paralleled the decline in the discovery of major new mineral deposits in Australia. “Decreasing mineral exploration success and expenditure in Australia reflect the fact that relatively easy-to-find mineral deposits with a surface expression have largely been discovered. New mineral exploration provinces must be found hidden beneath barren cover rocks, such as those covering hidden deposits in the Gawler Craton. The world-first technologies developed by DET CRC that were trialled during the MSDP deliver real-time information during a drilling program, which in-turn enables real-time decision making. The technologies trialled included the following. Wireless Sub – monitors drilling parameters, such as the downward force on the drill bit, enabling them to be analysed at the drill site and remotely in order to optimise drilling performance and maximise productivity. Fluid Management System – provides real-time information on the chemistry of the drilling fluids and facilitates maintaining these fluids in the optimal condition for efficient drilling. AutoSonde with gamma sensor – provides geophysical wireline log-type data on the nature of the rocks intersected in drill holes without separate mobilisation of a wireline logging crew or additional time requirements at the drill site. The AutoSonde is deployed into the hole by the driller and analyses the rocks intersected as the drill rods are pulled out of the hole. AutoShuttle – deployed downhole by the driller in a similar way to the AutoSonde and acquires data while drilling is progressing. It is ‘shuttled’ to and from the surface (with its recorded data) every time the core barrel is retrieved, typically every three metres. Lab-at-Rig® – provides near real-time XRF geochemistry and XRD mineralogy on drill cuttings, allowing greater confidence in assessing the prospectivity of the drill core. All results can be monitored remotely and permit ongoing analysis of the drilling program, informing decisions such as whether to terminate or extend drill holes or whether to modify the location or trajectory of subsequent holes. Geologists and managers anywhere in the world, from the rig-site to head office, will have access to real-time data advising on key matters, such as ‘is the rig operating efficiently?’, ‘has the target depth been reached?’, ‘has the geophysical target been explained?’, ‘have metals been intersected?’. Drill holes can be analysed by experts remotely, worldwide and where encouraging results are encountered, follow up holes drilled immediately, without the great cost of demobilising drill rigs and crews, waiting months for analyses, then remobilising back to remote locations. Mineral Resources Minister Tom Koutsantonis said real time exploration is a breakthrough that will change the way the resources sector conducts exploration and mining forever. “Real time analysis allows people in the field to make decisions then and there. “People in Boardrooms can be analysing this data, making decisions about where the next hole will be and how to invest those vital exploration dollars. The South Australian Government has backed the DET CRC’s unique approach to exploration with an investment of $2.5 million from their PACE Frontiers programme. An additional $1 million was provided by Minotaur Exploration, Kingston Resources and DET CRC. In-kind support from the many parties involved in the project leveraged the $3.5 million cash into an $8 million program. Within the project the Geological Survey of South Australia applied advanced approaches to mapping mineral systems and identifying the footprint of ore bodies. New models and knowledge gained from this work will assist explorers in the region in future years and decades – and will be shared at a workshop in August at the recently opened South Australia Drill Core Reference Library.